Whenever we meet to sketch at a cafe we always try to sketch our food before we eat it and we always joke about what a great diet it would be to do that at every meal. It not only helps to slow down eating, but it also helps to speed up sketching! This leads to looser, more playful sketches which I think are more fun to make and to see. Sonia and I met for lunch at The Junket, a deli in El Cerrito Plaza. My Turkey and Swiss Sandwich on a sourdough baguette (sketched above) was the best I’ve had in years. It was my second choice though, as we originally ordered Chicken Dumpling Soup. But when I saw them spooning it into a bowl, it had the consistency of gloppy, yellow gravy. I asked if it was cream-based (Sonia is allergic to dairy) and they said no, they knew it wasn’t because they reconstitute it with water. Um…no thanks. I switched to the half sandwich and Sonia got salad and we were happy. On our next Tuesday night sketch-out we met at the Bread Workshop. They had contacted me the week before to ask if they could use this previous sketch I did there to illustrate a newsletter they are sending to supporters and I gladly said yes. They reserved a large table for us with a view into the bakery so that we could draw the bakers working. I wasn’t much up to that challenge as it was my first night out after being sick for two weeks and my sketching felt rusty. You can see Micaela’s wonderful sketch here and Sonia’s here and here. The food was fantastic: my grilled veges (above) were so flavorful! This was the extent of my drawing bread and bakers. The Bread Workshop are advocates of sustainable foods and practices and ranked as one of the top ten greenest restaurants in the Bay Area. Everything I’ve had there has been delicious and they were playing great music that night, going from George Benson to Billy Holiday to Tom Waits in succession. You’re right it does speed up your sketching: and when hunger (or, at least, the desire to eat…..) gets the better of me, I’ve tried taking a pic on my phone, and finishing the sketch later on but it feels ridiculously ‘touristy’ . . .
I’m meeting 2 bloggers for brunch…maybe we’ll sketch? Nah! We’ll be too busy talking! Great to see your sketches. Your stories are always fun. And it was a bonus to get the links to Sonia’s and Micaela’s sketches, too. Fun, also, that some of the eateries hope to use some of your sketches. sorry you were sick and welcome back to the land of the living. 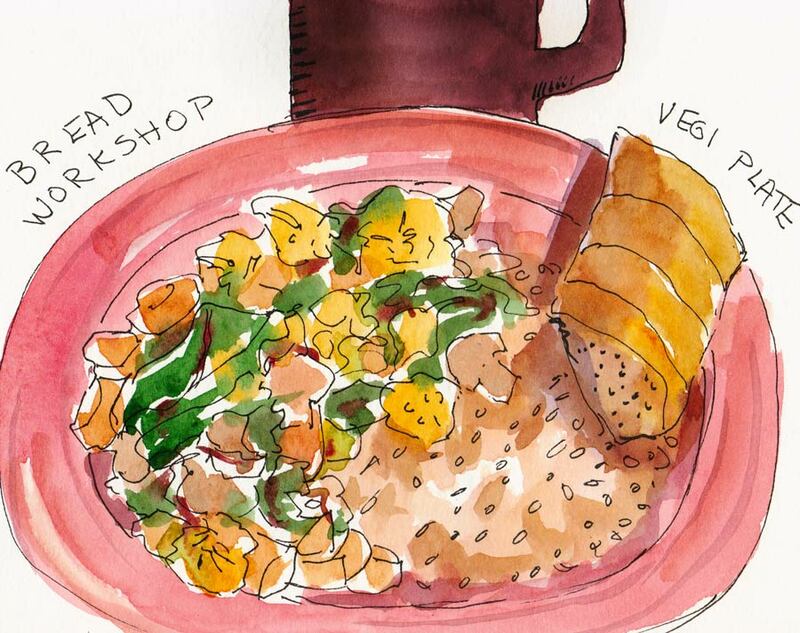 Why didn’t I think of that – Drawing your food before you can eat sounds like a perfect way to lose the winter flab! 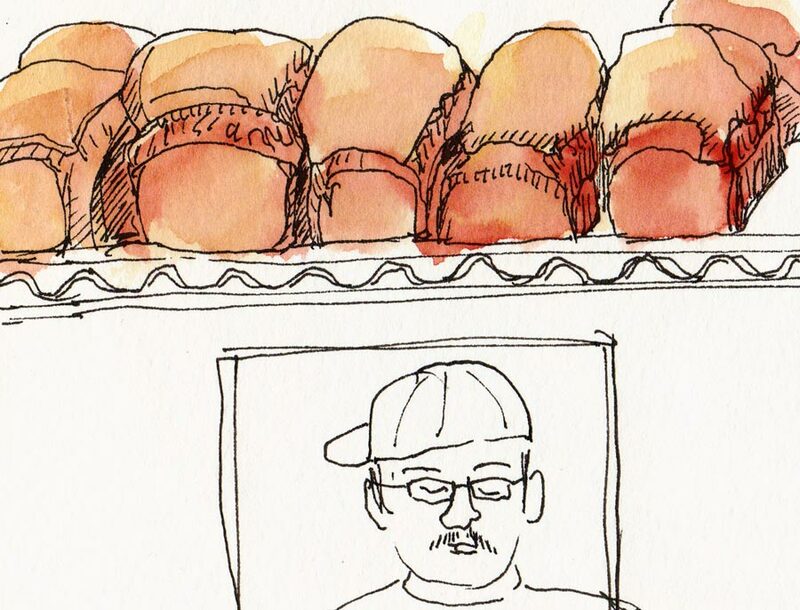 Seriously, I enjoy your tales of sketching in public. What fun and fantastic results. love your food sketches. 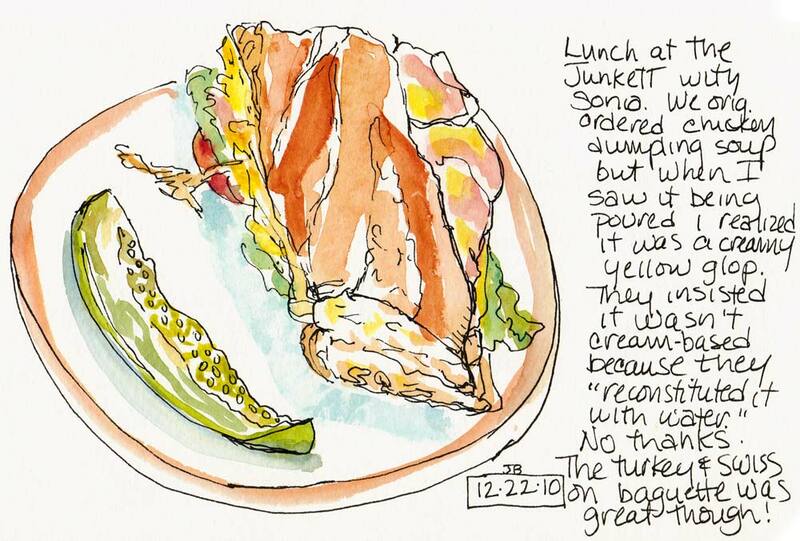 LOVE that sandwich sketch, and the whole concept of painting what we eat! That is a fabulous idea. Sorry to hear you’ve been sick. I was worried your absence of posting was about your new analog resolution! Anyway, glad to see you back at it—looks like you definitely made the right choice for lunch! Reconstituted with water? eewww! Great choice and wonderful sketches! Glad you’re feeling better! I can laugh about it now but at the time I thought I was about to die! Last Friday afternoon on the way to a mourning ceremony, the four of us stopped at the crowded suburb of Frankston – definitely not yuppie – at Macdonalds and we ate the usual stuff. Outside, ten minutes later, I felt like the end of the world, so raced back inside to the bathroom, then sat at a table. I was still really feeling bad until I ‘gave it all back to them’! Four girls scurried to another table and poor Peceli became my nurse. I should have made a drawing of the meal instead of eating it! Now I will NEVER eat hamburgers again in these sort of places! Pardon the story of vomitus maximus. What fun and very cool to look at! Wonderful drawings and wonderful dieting idea.